Please email me at matchgrams (at) gmail.com with any comments, questions or information. Hi I am reseraching a paper on the history of journalism/media at UCD. If anyone there can help me in anyway, i would be much obliged. I have a couple of copies of “Student – UCD’s Independent Newspaper” from 1974/5 – have you access to that through the NLI? If not, let me know and I can do some PDF scans. They include a priceless cartoon strip called “The Killybog Chronicle, incorporating the Letterfart Liar”! Some cool stuff, Ed. Those ‘UCD Student Club Lifetime Membership’ cards were only given to a few people, all of whom were former members of the ‘Students’ Club committee of management. UCD Student Club was the old name for the UCD bar. I remember reading Bread and Roses! Check out the photo you have on your home page…is that really Gene Kerrigan scowling in the right corner? I’m not too sure Dermott. 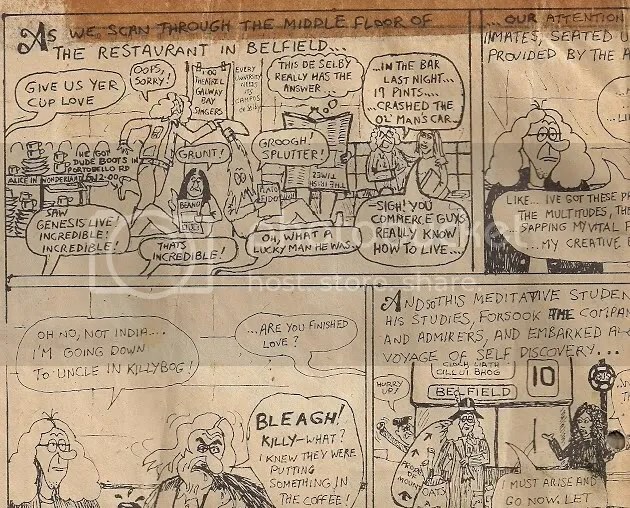 It’s from the cartoon strip “The Killybog Chronicle” that I mentioned above. It immortalises a lady called Alice who used to work in the coffee bar in the Belfield restaurant, her catchphrase being “Give us yer cup, love”, anyone remember her? I noticed on Indymedia that you were looking for details of an incident where a girl passed away in the mid 90s. The incident occured on April 26 1996, reports on the inquest can be found in the The Irish Times and Irish Independent archives, Friday December 06 1996.